Cleaning and washing with Alkaline ionized Water withouth chemical soaps and detergents, rinsing, embalming, beauty and Disinfection with acidic ionized water without chemicals. Alkaline Water (many levels of alkalinity, from about 7.5 to about 11 pH. 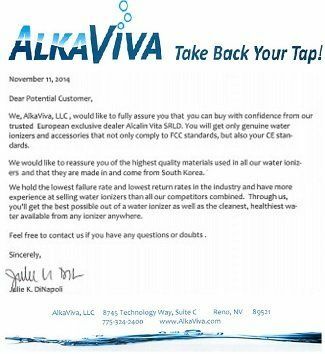 Alkaline water is harder than any other water to store in such a way as to keep the pH/ORP qualities. Therefore An entire page to show you exactly how to store alkaline ionized water well. Filtered Water (not ionized, usually neutral pH (it will have the same pH as your source water). For babies and toddlers it’s best to use filtered water which is neither alkaline nor acidic. pH range 7-8. Also, when you are taking medication filtered water is best. Acid ionized water: If you set your ionizer on and acidic-level, alkaline ionized water [which is drinkable by the way] will come out the bottom hose, Otherwise, acid water comes out of the bottom hose or spout when you are pouring alkaline ionized water. Acidic water stores very well. You can keep it in an open container, tub, etc. and it will remain the same acidity as when you poured it. Drinking alkaline ionized water: At 8.5 pH to 9.5 or 10 pH alkaline ionized water is the perfect drinking water. It will help to neutralize the acidity of the body and slightly alkalize the body. Alkalizing the body will help to ward off infections, cancer and other invaders to the naturally healthy state of the body. Alkaline ionized water also assists in the safe removal of toxins from the body. In addition to the health-benefits of alkalizing your body, the negative ORP [oxidation reduction potential] of alkaline ionized water will provide the body with lots of easily absorbable antioxidants. Anti-oxidants are important in order to prevent free-radical damage that would otherwise be caused by oxidation within the body. Directions: Start drinking at about an 8.5 pH and slowly work your way up to 9.5 pH. For best results, don’t rush it. Natural vitamins & alkaline ionized water: Feel free to drink whatever level of ionized water you are drinking with taking your vitamins. Microclustered, ionized alkaline water will assist in the best and fastest absorption of vitamins into your body. You can pour a bowl of the high alkaline and a second one of acidic water… for cleaning fine washables [like stockings, silk skarf, etc.]. When you do this I suggest to let it soak for several minutes in the high alkaline, then agitate and wring-out the garments. Follow this up with a soak in the low acid water, which will act as a germicidal, softener [removing any residual alkaline minerals], and freshen it up. You can pour 2 – 4 gallons of high alkaline in with your laundry and not need to use detergent. You can use high alkaline for cleaning greasy areas, like floors, stoves and countertops. Medications: A neutral 7.0 – 8.0 pH filtered water is perfect for taking medications. For 20-30 min. before and after taking medications it is suggested to only drink filtered water. The chemical make-up of medications and the predicted rate of absorption into the body can be altered by consuming microclustered, ionized water with them. Rather than take a chance of messing up your doctor’s plans, it’s better to just take the safe route described here. Infants & Todlers: A neutral pH is perfect for babies. Give babies and todlers “filtered” water, not ionized, until they are about 2 years old. After that, you can slowly introduce them to ionized water [i.e., over the next 2 – 3 years use level 1, then do the same for level 2, etc.]. At about 9 or 10, a child can drink the same level as an adult. Acid ionized water as Skin Toner and Conditioner: Your acid mantle [outermost layer] of your skin is your body’s first line of defense against bacterial, fungal or viral infections. It is important to maintain this acid mantle at about a 5.5 pH. However, because of the nature of soaps [soaps are typically a high alkaline pH in order to emulsify and flush away oils] the acid mantle is often left at too high of a pH after bathing or showering. The consequences of this is a breakdown of the acid mantle, drying out of the skin, and roughness caused by a build-up of alkaline minerals left on the skin. Rinsing with acid water helps to remove the residual alkaline minerals and restore your skin to its perfect 5.5 ph-level. Hair Rinse with acid ionized water: Shampoo is most often found at a high alkaline pH. A high pH solution applied to your hair will open up the hair cuticles [the cuticle is the outermost hair-layer surrounding each hair shaft], and expose it to becoming dry and damaged. It is most beneficial to the health and beauty of your hair to close the hair cuticle . The cuticle opens with a high pH and closes with a low pH. When you rinse with water at a pH of about 3.0 to 4.0, this low pH water combines with the high pH of your newly washed hair and restores it to its ideal pH of about 5.5. Beauty Secret: Hair that has tightly closed cuticles has a smoothe, shiny, silky look to it and doesn’t split at the ends. Acid ionized water as Natural, Healthy Coolant: Acidic water can be placed in a spray bottle and brought with you to sports or other outdoor events in hot weather. When you set your bottle to mist, this has an air-conditioning effect of cooling off your body. It’s healthier for you to use acid water at about a 5.5 pH in your mister, rather than regular tap water, because the goal of misting is to cool yourself, not change the pH of your skin. The proper pH of skin is about 5.5 pH. Acid ionized water as Natural Laundry Softener: Add acid water to your final rinse cycle of any load of laundry. This removes residual alkaline minerals from the clothing, brightens up the colors, and softens the laundry naturally, without the use of chemicals. Acid ionized water for plants: Acid water at the pH levels of 5 – 7 pH is great for watering plants. Plants love the purified micro clustered water, and they also love the water to be slightly acidic. Flowering plants tend to like lower acidity than green shade-plants. Acid ionized water as Antimicrobial/Germicidal Water: To kill germs it is best to use acid water at the pH level of 2.5 – 4. The lower the pH the faster the germs are killed, but even at a 4 pH, if you soak something for about a minute it will kill the germs on it. Laboratory testing has proven that exposure to acidic water at a 2.5 pH and lower kills germs on contact.